After Minneapolis author David Housewright wrapped up his Holland Taylor detective series (temporarily, as it turned out) he moved on to create another Minneapolis PI with a slightly more Travis McGee flavor – Rushmore McKenzie, former St. Paul police detective. “Mac” didn’t leave the force because of a traumatic experience or a principled conflict with the brass. He recovered several millions of embezzled money, and the insurance company paid him a 50% finder’s fee – but only after he’d resigned. Now he lives in a big house and, like Travis McGee, just “does favors for friends.” Unlike McGee, he doesn’t care about being paid. 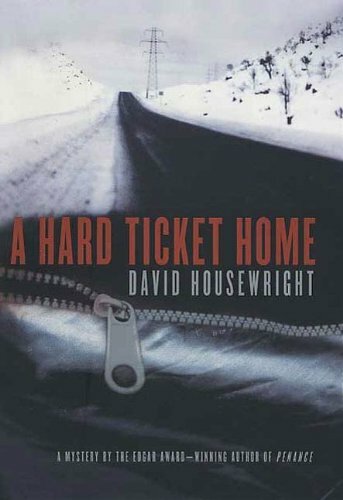 Hard Ticket Home is the first book in the series. The Carlson family of Grand Rapids, Minnesota needs a favor. Their youngest daughter is dying of leukemia and has to have a bone marrow transplant. They think their older daughter Jamie might be a compatible donor – but Jamie ran away several years ago. Mac agrees to try to find her. This leads him to walk into – and partly set off – a murderous crime spree involving some of the most successful people in Minnesota – people hiding a very dark secret. They have dangerous associates who don’t like private eyes snooping around, and some of them have no scruples about killing Mac – or the people he cares about. I enjoy Housewright’s stories very much, and I always relish a Twin Cities setting. My only concern is that as he goes on he comments more and more on politics. He’s fairly mainstream, but I think he hits the right harder than the left. But he hasn’t lost me yet. Cautions for language, very ugly violence, and mature themes.